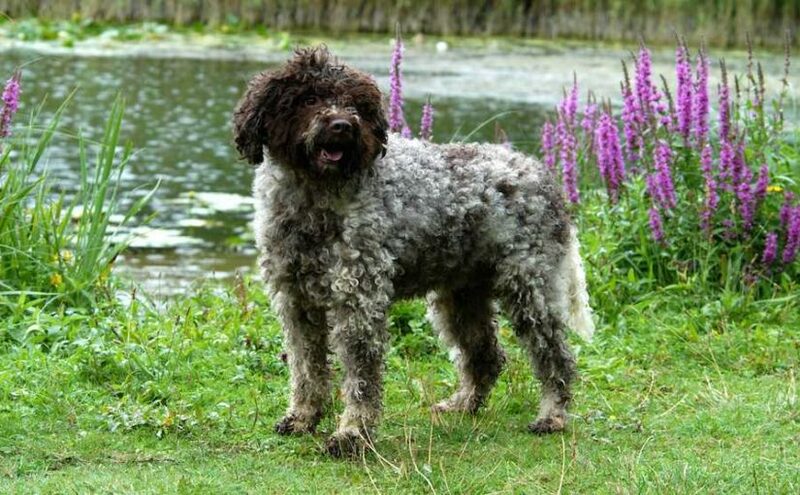 Lagotto Romagnolo is an ancient breed of water retriever from the lowlands of Comacchio and marshlands of Ravenna, Italy. Over the years, the marshlands were drained and turned into farmland and the Lagotto lost his job. But it wasn’t long before he found a new occupation and the Lagotto Romagnolo changed from a water dog to a truffle hunter in the Romagna region. A natural gift for searching and a very keen nose made him very efficient at his new job. General Appearance: Small to medium-sized dog, well proportioned, square, of a rustic appearance, sturdy and robust, with a dense, curly coat of woolly texture. 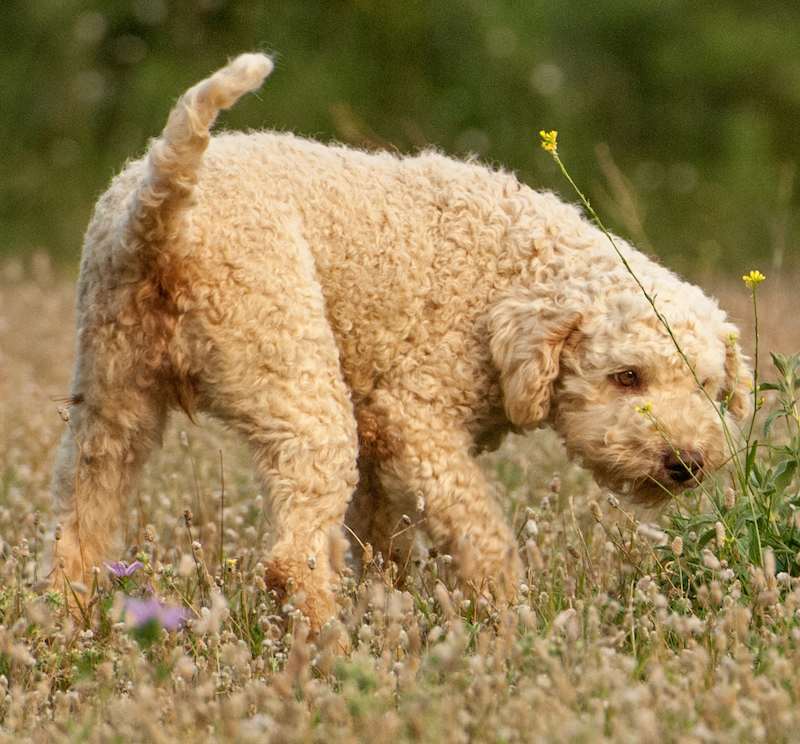 Lagotto Romagnolo Temperament: The natural gift for searching and its very good nose has made the Lagotto Romagnolo breed a very efficient worker in truffle searching. The former hunting instinct has been eliminated; hence his work is not distracted by the scent of game. 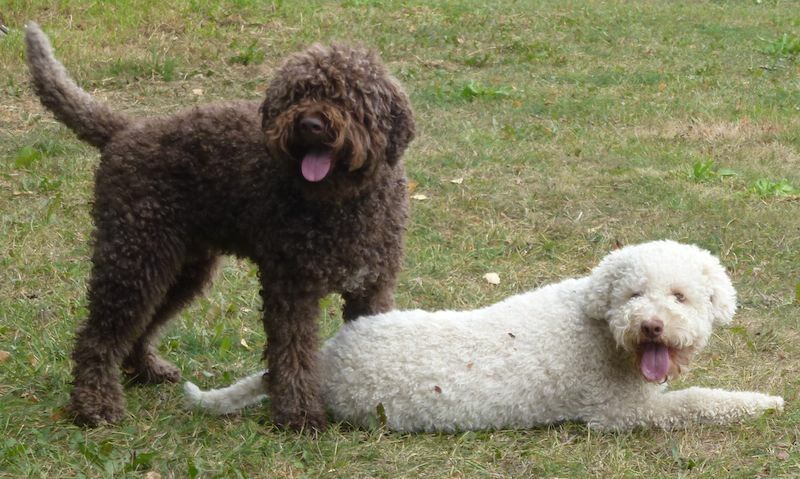 The Lagotto is temperate, keen, affectionate, very attached to his owner and easy to train. He is a very good companion and also an excellent warning dog. 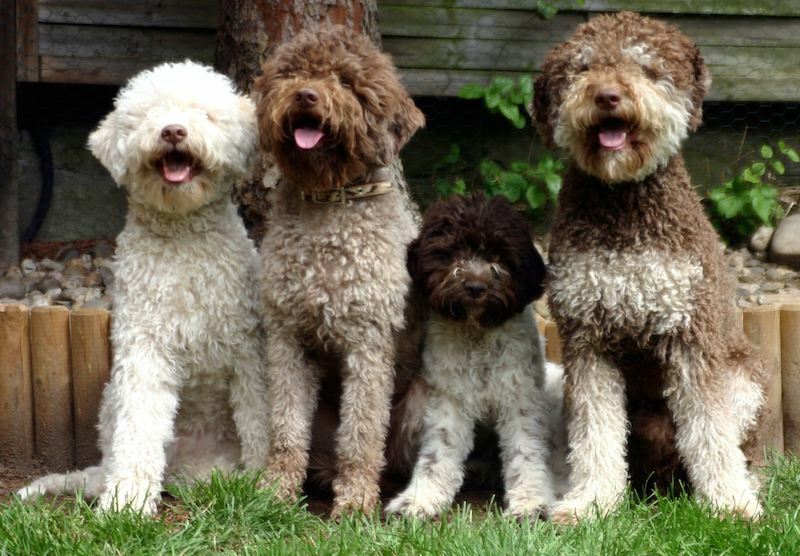 Lagotto Romagnolo Size: The length of the head reaches 1/10 of the height at the withers. The dog is nearly as high as long. Height at the withers Males from 43 to 49 cm (ideal height: 46cm). Females from 41 to 46 cm (ideal height: 43cm). Tolerance 1 cm more or less. Weight Males about 13 to 16 kg. Females about 11 to 14 kg. Lagotto Romagnolo Coat & Colour: Hair: of woolly texture, a little rough in surface, forming very thick, ring-shaped curls with visible undercoat. Curls must be homogeneously distributed all over the body, except on the head, where the curls are more loose, forming abundant eyebrows, whiskers and beard. Even the cheeks are covered with thick hair. Skin: Close fitting all over the body, without wrinkles, thin, with scarce subcutaneous tissue, Pigmentation of mucous membranes and of the carpal, digital and plantar pads ranges from light to dark and very dark brown. Coat: The coat with the undercoat are water-proof. If not cut, the hair tends to felt; therefore, a complete clipping must be performed at least once a year. Felted hair and undercoat must be removed periodically. Colour: Dingy white or white solid colour, white with liver-brown or orange markings, liver-brown roan, liver-brown solid colour (in different shades) orange solid colour. Some dogs have a brown or dark brown mask. Head: Viewed from above trapezoidal in shape, massive and moderately big; in profile the upper longitudinal axes of the skull and the muzzle should be slightly diverging. Skull: is wide at the zygomatic arch where its length is equal to its width. Viewed from the side, the occiput to stop, the skull should be longer than the muzzle. It is slightly convex and tends to flatten out towards the occipital region. Frontal sinuses well developed, superciliary arches marked, mediofrontal furrow pronounced, occipital chest short and not much developed, supraorbital fossae slightly marked. Stop: is evident, but not very marked. Nose: bulky with very wide open and mobile nostrils. Median groove strongly pronounced. Viewed in profile, the nose continues on the same level as the muzzle and protrudes very slightly from the front face of the lips. The colour ranges from light to dark liver brown, depending on coat colour. Muzzle: fairly broad, decidedly short than the skull (ratio: skull 56%, muzzle 44%), the depth being only slightly less than the length, it is slightly wedge shaped, with a moderately flat anterior face. The nasal bridge has a rectilinear profile. Lips: scarcely developed lips are covered with long and quite bristly hair forming whiskers so that the lower profile of the muzzle is determined by the mandible. Viewed from the face, the lips form a wide semi-circle. The colour of the labial edges ranges from light to dark liver brown. Cheeks: flat. Jaw: strong and white rectilinear branches and a relatively large mandibular body. Teeth: scissors or pincer bite, tightly undershot mouth acceptable. Eye: fairly large, rounded, on a level with the skin, set fairly apart. The colour of the iris ranges from ochre to hazel and dark brown depending on the colour of the coat. The close-fitting eyelids, the colour of the eye-rims ranges from light to dark liver brown. Look alert, expression keen and lively. Ears: medium-sized in proportion to the head, triangular with rounded tips; rather large set just above the zygomatic arch. Hanging at rest or slightly raised when the dog is attentive if pulled towards the nose they should reach the muzzle at a ¼ of its length. On the ears, the hair tends to show looser curls, but remains very wavy. No short hair on the ear. The inner part of the ear-flap is covered with hair. Neck: Stout muscular, lean, with oval section; well detached from the nape and absolutely free from dewlap. Top line slightly arched. In males, the perimeter of the neck can reach twice its length. Forequarters: Perpendicular, seen from the front or in profile. Shoulder: shoulderblades long (30% of the height at withers), well laid back (52-55 degrees), muscular, strong and closely attached to the chest, but giving free movement. The scapula-humeral angle ranges between 110-115 degrees. Upper Arm: muscular, of thin bone structure, as long as the shoulder blades; its inclination on the horizontal line ranges from 58-60 degrees. Elbows: close, but not too tightly to the chest; covered with thin skin; as the uppers parallel to the sagittal plane of the body. The tip of the elbow is located on a vertical line lowered from the caudal angle of the scapula to the ground. Forearm: Perfectly straight, long (36% of the height at withers), with compact, strong bones of oval cross-section. Pastern Joint: Viewed from the face in vertical line with the forearm; fine, robust and mobile; pisiform markedly protruding. Pastern: rather smaller and thinly boned compared to forearm, elastic, with little subcutaneous tissue; seen in profile, forms an angle of 75-80 degrees with the ground. Forefeet: slightly rounded, compact, with arched and tight toes. Nails strong and curved. Pads well pigmented, interdigital membranes very well developed. Body: Compact and strong; almost as long as the height at withers. Topline: rectilinear from the withers to the croup. Withers: they rise above the level of the croup; they are not narrow, but quite high set and extended backwards. Back: Rectilinear, very muscular. Loin: short coupled, strong, in profile slightly arched. Width is equal or exceeds the length. Croup: long, large, muscular, slightly sloping (cozal inclination ranges from 25-30 degrees). Chest: well developed, reaching down to the elbows. Although fairly narrow in front, from the sixth rib the chest widens backwards. Underline and Belly: Long sternal section followed by a short section forming a straight line and by a long line sloping gently towards the abdomen which rises in form of a semicircle; the abdomen is not too tucked up. Hindquarters: Perpendicular, powerful, well-proportioned to the size of the dog. Thigh: long (35% of the height at withers), with clearly separated and visible muscles. The axis of the femur has a markedly top/down and back ahead inclination of 80 degrees on the horizontal line. The coxofemoral angle ranges from 105-110 degree. The thigh is parallel to the median plane of the body. Stifle: the angle of the stifle joint ranges from 130-150 degrees. Lower Thigh: slightly longer than the thigh (33% of the height at withers), well boned and muscled, with marked muscular groove. Its inclination to the horizontal line ranges from 50-55 degrees. Hock Joint: large, thick, lean with clear-cut bone outgrowths; parallel to the medium plane of the body; the tibio-matatarsal angle is ca. 140 degrees. Hock: thin, cylindrical, perpendicular to the ground. Hindfeet: slightly more oval-shaped and toes not as arched at the forefeet. Tail: Neither too high nor too low set, tapering towards the end. When extended, it should slightly touch the hocks. At rest carried scimitar-like; when attentive decidedly raised. When working or excited can be carried over the back, but never curled. Gait: Pace regular, trot resolute and lovely, gallop in short periods. Lagotto Romagnolo Faults: Any departure from the foregoing points should be considered a fault and the seriousness with which the fault should be regarded should be in exact proportion to its degree. Axes of the skull and the muzzle converging ; Dish faced ; Pronounced and disturbing undershot mouth ; Butterfly nose ; Bilateral strabismus ; Coat not curled or close shaven Black coat or black markings ; Docked tail ; Oversize or undersize. Disqualification: Overshot mouth ; Depigmentated nose ; Wall-eye ; Ropelike coat Guideline Measures Length of head reaches 4/10th of the height at the withers, length of skull should slightly more than 50% of the total length of the head; length of muzzle is 2/10th less than that of the skull (44% to 56%). Depth of muzzle should be 8.5/10th of the length of muzzle (about 40% of the total head length), width of muzzle should be 3.5/10th less than the length of the muzzle (about 29% of the total length of the head), neck should be 8.5/10th of the total length of the head, length of back should be about 33% of the height at withers, length of loin should be about 1/6 of height at withers, length of croup should be about 32% of the height at withers, depth of chest is less than 50% (about 44%) of the height at withers, forearms should be 56% of total height at withers.